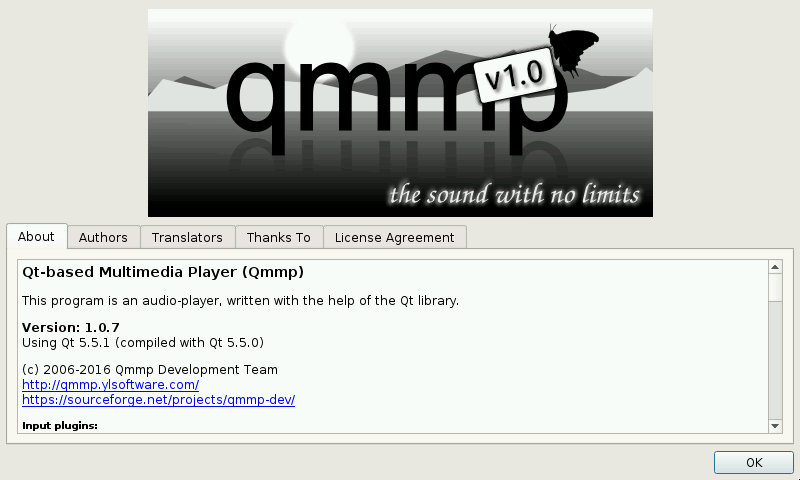 Qmmp - Qt-based multimedia player. This program is an audio/video player, written with the help of the Qt library. - Updated TagLib to 1.11. - Latest stable release, compiled with QT 5.6.0. - Latest stable release. See Changelog. - Updated libopus, with 15% more Neon optimization improving performance, and sources. - Latest stable release, compiled with QT 5.7.0 from latest beta Codeblocks PND. - Updated Game Music Emu to 0.6.1. - Compiled with QT 5.11 from latest beta Codeblocks PND. - Updated libsidplayfp 1.8.8 and sources. Compatible with ALSA and JACK (while QjackCtl PND is installed and running). Can you confirm where the skins should be put ? Confirmed, there's a regression with the equalizer, i normally use JACK plugins instead. SID doesn't work with stable version, and JACK support is not bad already, it just needs to be updated to 0.121.3 to be good. This port is slower than the other QMMP in the repo. Audio starts to stutter when the equalizer is on, even on 1.2Ghz overclocked. Did not test SID's yet. Still, JACK suport is a nice to have, maybe for the Pyra. @naryl Got it... but what do you use it for in this particular case?